At the first trustee meeting after the AGM, on 11 December 2018, the trustees re-appointed Judie Hodsdon as Chairman, Fiona Clarke as Secretary and Paul Benfield as Treasurer. Gloria Jones continues as Membership Secretary and Chris Archibald as Green Space Volunteers co-ordinator (and much more). Andy Hopkins remains as editor of the newsletter and Sandy Marshall takes over as the Pittville History Works representative. Other trustees are responsible for specific events and/or are members of one of the teams. One of our members, Jocelyn Potter, has very kindly volunteered to take the minutes at our trustee meetings and at the AGM. Click here for more information about our trustees. Hilary Simpson stood down as a trustee at the AGM but continues to lead the Pump Room Action Group. She is also maintaining this website and our Facebook page until new trustee Adrian Allen is able to take over. Thanks to Hilary for her significant contribution as a trustee and as a founder member of the Pittville History Works group. We are sorry to say that an illustration on the back page of the December newsletter was printed backwards. This is how it should have looked. 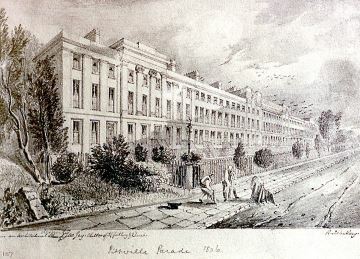 Entitled ‘Pittville Park’ and drawn by Audrey Yabsley, it appeared in a 1936 magazine from Pate’s Grammar School for Girls. With thanks to the Archive of Pate’s Grammar School who can be contacted at archives@patesgs.org.